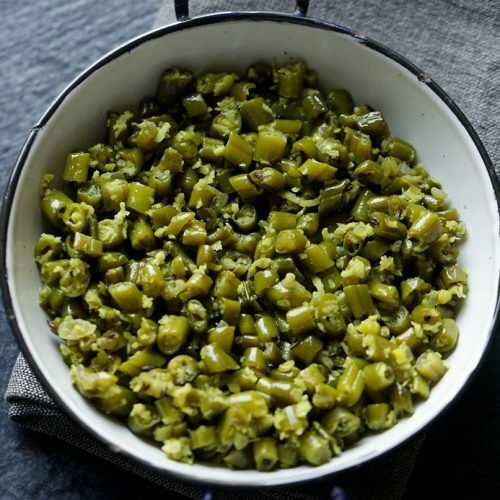 beans thoran is a delicious beans recipe made with french beans (green beans) from the kerala cuisine. apart from the fewer spices used, both fresh grated coconut and coconut oil gives this dish a remarkable flavor and taste - not to forget the taste & flavor of beans that also merges well with the coconut flavors. firstly rinse 250 grams beans a couple of times in water. then drain all the water. chop the beans finely. discard the top and the end portions of the beans. you will need about 1.5 to 1.75 cups finely chopped beans. heat 1 tablespoon coconut oil in a heavy pan or kadai. add ½ teaspoon mustard seeds. let the mustard seeds crackle. when the mustard seeds begin to crackle, add ½ teaspoon cumin seeds and let them crackle. next add 6 to 7 pearl onions (sambar onions) or shallots which have been chopped. you can also use ¼ to ⅓ cup finely chopped onions instead. mix well and begin to sauté onions on a low flame. sauté till the onions turn translucent. do not brown them. then add 3 to 4 small to medium garlic cloves (finely chopped), 1 green chili (chopped) and 10 to 11 curry leaves. mix well. add ¼ teaspoon turmeric powder. mix again. now add the finely chopped beans. stir and mix well. add ½ cup grated fresh coconut. season with salt as per taste. mix very well. sprinkle about 4 tablespoons water first and stir. cover and cook beans thoran on a low flame. check after 3 to 4 minutes. if water has dried up, then sprinkle some more water. mix well and continue to cover and cook. overall you can add ⅓ cup water or more as required. add water in parts. cook till the beans are completely cooked. if there is any water in the pan, then cook the beans thoran without lid till the water evaporates. serve beans thoran with steamed rice or a side vegetable dish in a sadya meal or kerala main course. if you want you can garnish with some coriander leaves.